The Boca Raton Park District is pushing all their chips in and betting on golf. 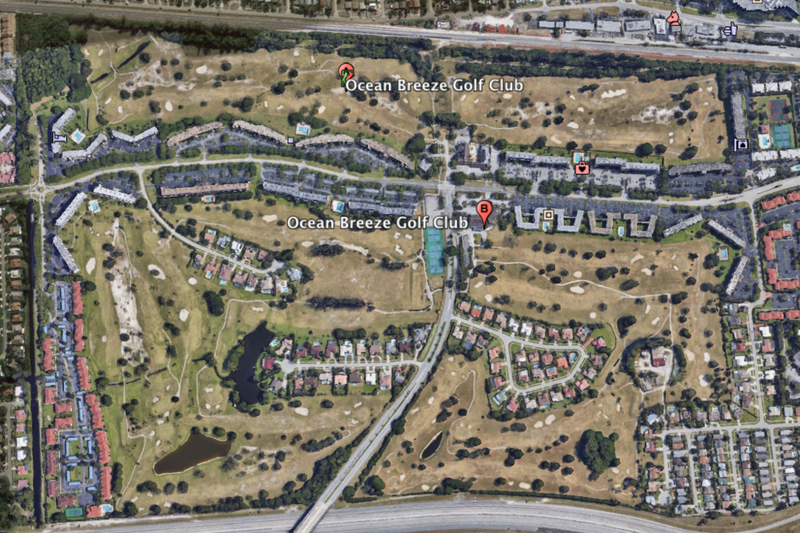 After selling off Boca Municipal Golf Course to a housing developer for $65 million, the parks district has used the money to purchase Ocean Breeze Golf Course and redevelop it as "Boca National." The purchase price of the new site was $24 million, and the park district plans to spend upwards of $18 million to renovate the defunct design. Yes, you did the math right, a $42+ million investment in golf. By comparison, it is rare for a city to invest even a fourth of that in golf. On the one hand, this should be a great opportunity to build an exceptional facility for a local community. It’s far different thinking compared to the majority of municipalities who look at their golf facilities as a chore. Boca Raton believes in golf, and they deserve credit for that. But a deep dive into the plans for "Boca National" project reveals a few alarming concerns. The shape, concept, mentality, and goals of the project make it feel like a community approaching golf course design like it's 1988, not 2018. The project director Art Koski seems astonished at the interest from architectural firms for an $18 million project. Fifteen firms submitted bids for "Boca National." For $18 million, the real surprise is that only fifteen firms bid. The list is dominated by the big name architects of yesteryear. Nicklaus Design, Rees Jones, Greg Norman and Robert Trent Jones are a few firms on the list. These firms made a fortune in the 80's, 90's and early 2000's capitalizing on big budgets and delivering tepid, uninspiring work. Koski remarked to Club and Resort Business News that "Almost every one of the proposers has a resume that would elevate this golf facility, they’ve designed some of the best golf courses in the country." Candidly speaking, many names on this list are overpriced given their body of work. The National Golf Foundation has partnered with “Boca National” producing a 157-page report. Beyond recommending the name “Boca National” the report details recommendations, budget and revenue projections for the potential facility. The report is extensive, but a glaring issue lies in the plan for 27 holes on the meager, awkward 208-acre site that used to inhabit Ocean Breeze Golf & Country Club. The course was built in 1968 by the esteemed Mark and Charles Mahannah and is heavily shaped and routed around affordable housing. The plan calls for 27 “championship holes,” a practice range, learning center, and clubhouse. To put that land into perspective, consider that Merion, widely considered the most efficient and magnificently routed golf course in the United States sits on 150 acres. It’s hard to imagine any architect being able to build 27 great holes of golf on the property Boca National is working with, which begs the question, why 27 championship holes? Why not 18 great holes and a short course or putting course or kids course? These options would certainly yield a better stand-alone golf course while providing far greater value to the community and aspiring golfers. An aerial of Ocean Breeze Golf Club, proposed site of "Boca National"
Although the state of municipal golf has been tumultuous, a handful of standout projects have made positive impacts on communities. These projects were rooted in the principles of sustainable, affordable and fun golf. A project that should be used as inspiration for the Boca Raton project is a few hours north and west, in Winter Park Florida. Winter Park 9 is an example of the future of community and municipal golf. Up and coming architects Riley Johns and Keith Rhebb renovated the 9-hole course on a shoestring $1.2 million dollar. The results have been spectacular; the golf course has seen a resurgence and gone from losing $250k per year to cash flow neutral in its first year open. The golf course design is terrific. Johns and Rhebb took a small, flat property and turned it into a design that is fun for golfers of all skill levels. It features wall to wall fairway, strategic bunkering, and exceptional green complexes. The course's success all comes from the vision of the Winter Park community. They set out to build a golf course that was sustainable, and that would grow the interest of the game within the community. Winter Park is a stark contrast to "Boca National's" aim to hire a big name firm to build a course with a massive budget. A recipe that is sadly sure to disappoint. Many factors that have played into the success of Winter Park. One that can't be overlooked was the selection of young architect's Johns and Rhebb. The pair touts a pedigree of years working under the era's most influential and successful architectural firms Coore & Crenshaw and Renaissance Golf Design (Tom Doak). Rhebb and Johns are two of today's talented young architects. The economy and lack of new golf course development have created a surplus of young golf course architect talent and a lack of demand. It's led to capable architects staying on as associates or contracting work with big design firms rather than becoming standalone brands of their own. Young architects are a perfect match for municipal golf. They come with fresh ideas, a hefty discount and are looking for the project that could change their career. In many ways, a project such as "Boca National" would mean more to a young-hungry architect than it will to the community. Their future as an architect is dependent on the success of a high-profile design. Their design fees also happen to come at a fraction of the cost. Winter Park went young and was rewarded with what will become one of the most significant golf course renovations of the modern era. "I don't know how an architect could go out to a sandy site on the Oregon coast and fail to be inspired by it, but it feels as though Sandpines was built by someone had never been to the beach when he was a kid. Designing the last three holes around a man-made lake in the middle of the dunes was the ultimate cliche." Sandpines had the potential to be a great project, just like Bandon Dunes. Sandpines hired Rees Jones, Bandon Dunes hired a young, hungry architect looking to make a name for himself. "If they pick the least expensive architect with the thinnest resume, they’d make a good decision." The Boca Raton Park District has yet to make a final decision on who will design their new golf course. I would urge the committee members to make a drive to Winter Park to see the success of Winter Park 9. I would also ask them to look around at the landscape of public golf in South Florida. It's a cesspool of unimaginative and overly penal signature designs that inspire golfers to take up new hobbies on the weekends. Be mindful of the budget but more importantly be different, bold and build a golf course for the community, not for your ego.